Hearts and minds are with Houston as the region struggles with ongoing displacement and devastation in the aftermath of unprecedented flooding from Hurricane Harvey. The following messaging guidance aims to help you communicate about this crisis - and future extreme weather events - in a way that is sensitive to those most affected, provides the climate context, and builds support for equitable solutions. Though the storm may be over, the crisis is only just beginning for those directly impacted by Hurricane Harvey. Communities of color and low-income neighborhoods, the same people who are on the frontlines of fossil fuel pollution, often have fewer resources for evacuation and recovery before and after severe storms. This cycle of climate injustice leaves those who already live in close proximity to oil and gas refineries, petrochemical plants or Superfund sites along the Gulf Coast to also bear the brunt of damage from extreme weather events like Hurricane Harvey. Undocumented people in the Houston region are in an especially precarious position as those without paperwork had to choose between sheltering in place or risking checking points while evacuating. "I would start with a message of concern and support for those who are suffering right now," said Kate Cell, Climate Campaign Manager at Union of Concerned Scientists. "To better protect and prepare communities for more severe storms and flooding, we need to understand that we are likely to see more Harvey-like storms in the future. We need to ensure that recovery efforts are just, locally-led, and reduce the number of people in harms’ way. And we need urgently to reduce our carbon emissions so that we can reduce the severity of the climate change impacts (heat waves and wildfires in addition to storms) that we can no longer avoid." A series of interactive maps from Direct Relief help visualize the under-resourced communities in Houston that are most vulnerable to climate-fueled impacts. By taking the time to understand the structural injustices that place frontline communities at greatest risk and involving those most directly impacted in decision-making processes, climate leaders can foster a more inclusive and effective approach to engagement. Communicators can best serve these communities by listening and empathizing with those on the ground to understand their personal experience and needs. Disasters like Harvey are not only fueled by climate change, their impacts are often exacerbated by problematic planning decisions and a long history of structural inequality. Increasing public understanding of how climate change amplifies hazards in light of extreme weather events is not partisan rhetoric, but the necessary context for designing better response systems and safeguarding communities from extreme flooding. Illustrating how climate change is a threat multiplier is critical for preventing future disasters and designing effective solutions. When climate change is omitted from the conversation, it can leave people with a misunderstanding that these are “natural” disasters without opportunities for reducing subsequent risks. Connecting the dots to climate isn’t insensitive if the message is based on authentic concern for those affected. 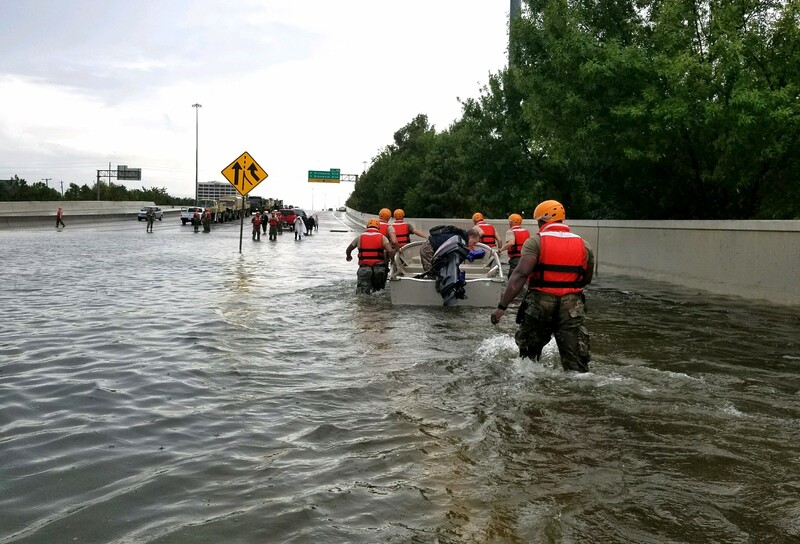 The crisis unfolding in Houston illustrates the indisputable need to reduce emissions and develop strategies to build equitable and resilient cities through improved prevention, preparedness, and recovery efforts. By encouraging people to participate in local resilience planning and support strong state and federal level climate policies, communities can begin to implement more effective stormwater management systems and make commitments for transitioning to 100% renewable energy to prepare for and reduce the threat of future storms. As once historic weather events are becoming the norm rather than an aberration, focus the conversation on the options that are already available, from preparation to clean energy, and how people can support these solutions. Highlight the co-benefits of climate action, such as equitable infrastructure improvements and emergency preparedness, to encourage public engagement at the local level and demonstrate how cities around the country are already making strides toward climate readiness.